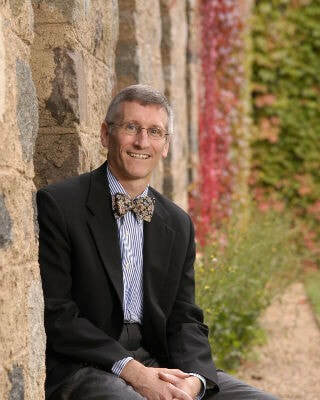 He has been on the faculty at Saint John’s since 1990, teaching both graduate and undergraduate classes and has been involved in various aspects of the development of the Saint John’s Bible and related work in theology and art. He previously taught at St. Mary’s University (MN). He holds a Master of Arts in Religion from Yale Divinity School and a Ph.D. from Yale in Systematic Theology. He was a founding member of the Rhodes Consultation on Church-related colleges, has chaired several accreditation teams for theological schools, served as a staff member of a pre-tenured faculty workshop for the Wabash Center for Teaching and Learning in Religion and Theology, and on the Faculty Development Advisory Committee of the Association of Theological Schools. In addition to the Society for Arts in Religious and Theological Studies he currently serves on the boards of the Louisville Institute, the American Benedictine Association and the Commission on Accrediting of the Association of Theological Schools. He has written on the work of Søren Kierkegaard, feminist theology, the identity of church-related colleges, the Catholic Intellectual Tradition, Benedictinism, and theological education. He is married and has three children.